Saudi Arabia’s education system has gone through an astonishing transformation. When the Kingdom was established in 1932, education was available to very few people, mostly the children of wealthy families living in the major cities. Today, Saudi Arabia’s education system includes over fifty public&and private universities, with more planned; some 30,000 schools; and a large number of colleges and other institutions. The system is open to all citizens, and provides students with free education, books and health services. While the study of Islam remains at its core, the modern Saudi educational system also provides quality instruction in diverse fields of arts and sciences. This diversity helps the Kingdom prepare its citizens for life and work in a global economy. Education is a requirement for every Muslim, both male and female. The Holy Qur’an and the Hadith [teachings and practices of the Prophet Muhammad] repeatedly emphasize the importance of learning. Methods pioneered by Muslim scholars and scientists during the Golden Age became the foundation of modern sciences, and were taught in European universities up to the 18th century. Formal primary education began in Saudi Arabia in the 1930s. By 1945, King Abdulaziz bin Abdelrahman Al-Saud, the country’s founder, had begun an extensive program to establish schools in the Kingdom. Six years later, in 1951, the country had 226 schools with 29,887 students. The first university, now known as King Saud University, was founded in Riyadh in 1957. In 1954, the Ministry of Education was established, followed by the Ministry of Higher Education in 1975. 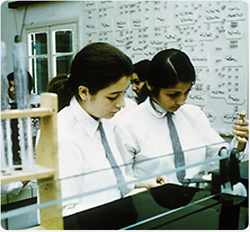 The first government school for girls was built in 1964, and by the end of the 1990s girls’ schools had been established in every part of the Kingdom. Today, female students make up over half of the more than 6 million students currently enrolled in Saudi schools and universities. The Saudi educational system aims to ensure that students are prepared for life and work in the modern world, while meeting the country’s religious, social and economic needs. Eliminating adult illiteracy is another major goal. General education in the Kingdom consists of kindergarten, six years of primary school and three years each of intermediate and high school. After elementary and intermediate school, students can choose whether to attend a high school with programs in commerce, the arts and sciences, or a vocational school. In high school, students take comprehensive exams twice a year under the supervision of the Ministry of Education. The educational curriculums at Saudi schools are diverse. They include a variety of subjects such as math, science, literature, history, Arabic and Islam. The Ministry of Education sets overall standards and oversees special education for the handicapped. The government continues to improve educational standards by offering quality training programs for teachers, improving standards for student evaluation, and increasing the use of educational technology. For example, in 2000 computer science was introduced at the secondary level. The administration of the educational system has also been improved by giving provincial school boards greater decision-making authority. These efforts are paying off. Not only has the number of Saudi schools increased dramatically, but so has the quality of education. The Kingdom’s student-to-teacher ratio of 12.5 to 1 is one of the lowest in the world. Saudi Arabia began focusing on higher education when the country entered a new era of rapid development in the early 1970s. In 1975, a separate Ministry of Higher Education was established. The Ministry launched a long-term plan to make sure that the Saudi educational system provided the highly skilled manpower the Kingdom needed to run its increasingly sophisticated economy. One of the plan’s first objectives was to establish new institutions of higher education throughout the country and expand existing ones. By 2014, there were 25 major public universities, a large number of vocational institutes, and a growing number of private colleges. Another objective was to establish undergraduate and postgraduate programs in most disciplines at these universities and colleges. As a result, Saudi students can now get degrees in almost any field in the Kingdom, and only pursue specialized study abroad if necessary. Currently, about 1 million students are enrolled at Saudi universities and colleges, compared to 7,000 in 1970 – a dramatic improvement. Of those, over half are female. Women attend all major universities, as well as numerous all-female colleges and private women’s universities. Saudi students also have the opportunity to pursue specialized graduate and postgraduate degrees abroad. Supported by government scholarships, thousands of Saudi students enroll in universities outside the Kingdom. The oldest university in the country is King Saud University in Riyadh. When it first opened in 1957, just nine instructors taught 21 students. Today, 65,000 students pursue degrees at the faculties of art, science, commerce, engineering, agriculture, medicine, dentistry, nursing, education, computer science and information science. The university offers doctorate programs in many fields and is particularly known for its engineering and medical schools. 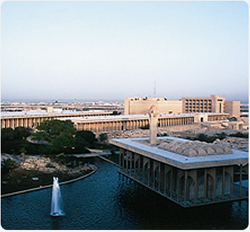 The largest university in the Kingdom is King Abdulaziz University in Jeddah, with over 70,000 students. It was founded privately in 1967 by a group of Saudi businessmen who believed strongly in the importance of education for national development. The university grew so rapidly that in 1971, its founders petitioned the government to take over its operation. The Islamic University at Madinah, founded in 1961, is renowned as a center for Islamic studies, with graduates from over 100 countries. Imam Muhammad bin Saud University in Riyadh (founded in 1974) and Umm Al-Qura University in Makkah (1981) have highly regarded Islamic law, history and Arabic literature departments, in addition to programs in the arts and sciences. Imam Muhammad bin Saud University offers programs in Islamic and Arabic studies at its branches in Japan, Indonesia, Mauritania, Djibouti and the United Arab Emirates. The Eastern Province’s King Faisal University, founded in 1975, offers a range of programs, including medicine and architecture, at its campus in Dammam. The Hofuf campus is especially respected for its outstanding agricultural and veterinary sciences programs, its experimental farms, and advanced research in agriculture and animal husbandry. 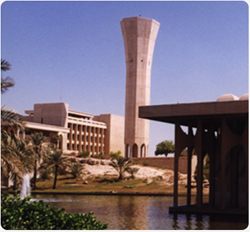 Other universities in Saudi Arabia include the King Fahd University of Petroleum and Minerals in Dhahran, one of the oldest (1964) and considered on par with the best in the world in that field; and Princess Nora bint Abdulrahman University (founded in 2007)the world's largest university for women with an enrollment of over 52,000 undergraduate and graduate students. The Kingdom has established a number of educational institutions throughout the world for Saudi students living abroad. The three largest such institutions are located in the United States, Britain and Germany. These schools accommodate students from kindergarten through the 12th grade, and provide instruction in Islam, and the Arabic language as well as the arts and sciences. In an effort to maintain a consistent standard, directors of these overseas schools meet regularly to discuss curriculums and other shared issues. In the Washington area, the Islamic Saudi Academy (ISA), established in 1984, provides students with the opportunity to study Islam and the Arabic language as well as an American curriculum. ISA is open to all interested applicants who are looking for an educational environment that is in accordance with the principles of Islam. It is an independent, non-profit educational institution. The Special Education Department of the Ministry of Education operates schools for the blind, deaf and the physically and mentally disabled. There are other institutes that care for elderly disabled people. These special schools are part of the Kingdom’s effort to encourage every individual to reach his or her full potential. 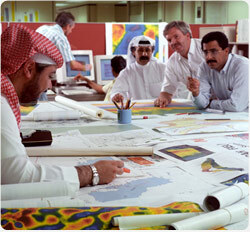 Adult education is another important part of Saudi Arabia’s educational program. The Kingdom established a large number of adult education centers in order to make education available to everyone and to eliminate illiteracy. For people living in isolated rural areas, the government conducts intensive three-month adult education courses during the summer. These efforts are clearly paying off: The Kingdom’s literacy rate is over 90 percent for men, and just over 70 percent for women. The literacy rate for children under 15 is 89.2 percent for boys and 93.2 percent for girls. Technical and administrative training is an essential part of education in the Kingdom. There are numerous public and private training institutions that produce thousands of graduates in the technical and mechanical sciences, health care, agriculture, teaching and other areas every year. These institutions include the Royal Technical Institute in Riyadh, the Hofuf Technical Training School, and centers in Jeddah, Madinah, Abha, Taif, Unayzah, Dammam and other cities. They train thousands of young Saudis in a variety of fields, including machine tooling, metalworking, electromechanics, auto mechanics, electronics and maintenance of industrial machinery. Another important institution is the Institute for Public Administration in Riyadh. Established in 1961 as a semi-independent public agency, the institute offers courses in administration, law, accounting, computer science, maintenance, personnel management, secretarial skills and management planning. Today, the institute has branches in Dammam and Jeddah, as well as a special branch for women in Riyadh. Most of the Kingdom’s vocational training centers and higher institutes of technical education are operated by the General Organization for Technical Education and Vocational Training (GOTEVOT), along with the Ministry of Labor and the Ministry of Social Affairs. The Ministry of Education runs vocational secondary schools, and several other government agencies operate institutes or training centers in their particular specialties. There are also a number of private training centers meeting the needs of the marketplace.